Concrete is among the most popular choices for both residential and commercial landscaping. Several advantages come with concrete sidewalks, and this puts it on the top of other construction materials. However, concrete also has its downsides because nothing is 100 percent perfect. This article will explore both the advantages and disadvantages of concrete sidewalks in your residential or commercial property. The price of installing concrete driveways is more affordable than the other construction materials such as the interlock pavers. The concrete material typically requires little or no maintenance. This feature will save you a lot of money and time in the long run. Concrete sidewalks can run you for over 20 years, and there is no way weeds will grow on a paved surface. Concrete is considered to be one of the robust materials for your landscaping. Concrete sidewalks can withstand a high level of tear and wear than the other concrete materials. Sidewalks are high-traffic surfaces like front entrances and driveways. Concrete will absorb any level of abuse without displaying any signs of frequent use. The most important thing is to install your concrete sidewalks in the right manner, and it will last you for more than 20 years. Employ SoFlo Contracting services, and you will realize all the above benefits. 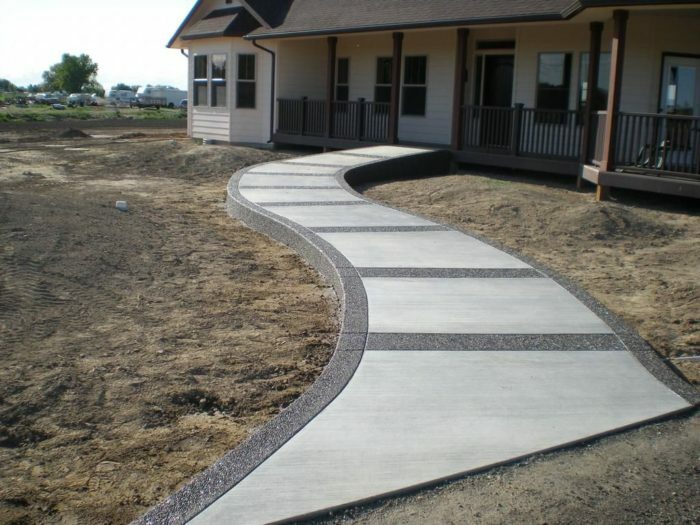 The concrete material will deliver a professional and polished finished to your sidewalks. You will not have to undertake several ongoing maintenance requirements. There is no better way of adding a curb appeal and impressing your visitors than the use of the concrete materials. Concrete has a broad range of color palette that you can choose from together with an endless list of patterns, texture, and shape possibilities. You will be able to customize your landscape to the content of your heart. If you finish your concrete sidewalks in light colors, it will remain cool under the summer blaring sun. This is a plus for any person who is fancy with walking around barefoot. In the cold winter months, you can easily remove snow from the concrete driveways. Therefore, concrete is a stress-free material for any homeowner. Most people will tell you that concrete is a hard material to repair. The reason is that you have to remove the whole affected area and make a replacement. This process is tedious, but the beauty of it is that concrete has a low rate of deterioration. Therefore, you will rarely expect concrete sideways repairs as long as the installation is handled professionally. Concrete, like asphalt, can crack over time. However, SoFlo Contracting professionals will make sure that they follow all the installation steps to avoid cracking. The process encompasses the materials that are used for the foundation, gravel, subgrade, rebar, and the distance that is between every bar. The end result is a solid base concrete sidewalk that will not crack. Professionals will make sure that the process they undertake eliminates any form of cracking on the surface. Concrete has a light color that will make it susceptible to staining. Tire marks and oil need special cleaning agents to remove. You can find all the detergents that you need to keep your concrete surfaces clean in the local stores. Therefore, the advantages of concrete sidewalks overweigh the disadvantages as long as you allow professionals to work on the project. Trust this project with SoFlo Contracting, and you will have no regrets in the long run.